Carlisle United have signed Northern Ireland under-21 defender Joe Dudgeon on loan from Manchester United until the end of the season. 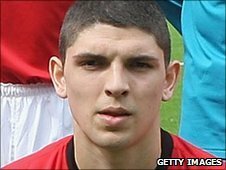 The 20-year-old full-back is yet to make a senior appearance for United, but was called into the squad for September's League Cup win at Barnsley. Manager Greg Abbott told the club website: "Manchester United speak very highly of him. "He has been solid and shown ability in the games that we have seen him play." Abbott added: "We've been looking at Joe ever since the injury to Sean McDaid happened, and we had actually watched him before that as one that we might try to follow up in the future. "He will come in and provide real competition for that left-back spot, as he is another very good young player. "He's the type of person and player that we want to add to the squad so we're delighted that he is joining us." The defender has been handed the number 26 shirt at Brunton Park.